My work lunch pal and I haven’t had a lot of time for each other lately, which has meant that I’ve been doing take-out solo and eating lunch at my desk. Tired of going to the same 4 places that are within a block from my office, I reached out to my co-worker to schedule me in for lunch this week. I was so happy when he agreed. Too hot for noodles in soup, which is usually our go-to lunch, we decided to venture out to Gyoza King on Robson. We ordered way too much food, probably because we were making up for all the lost lunches from the past few months. 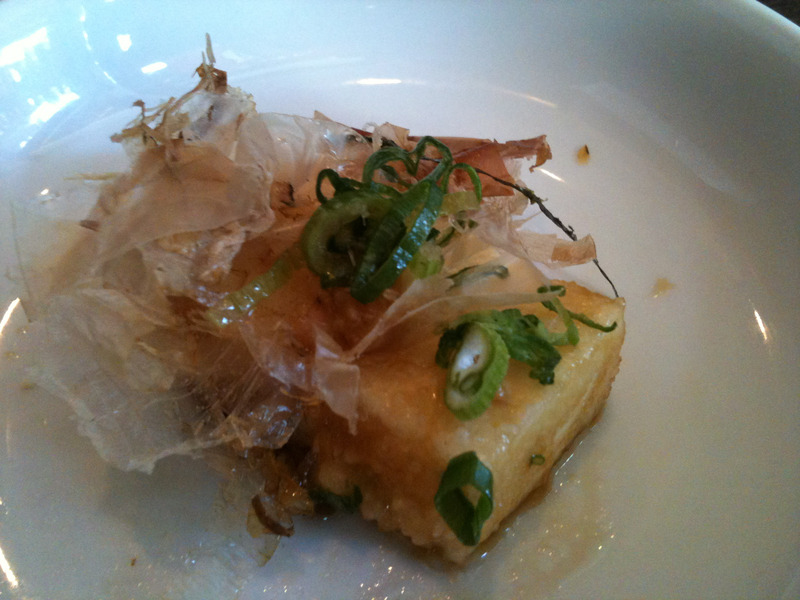 We were both starving so an order of agedashi tofu was a last minute addition in hopes that it would come out quickly. It did, and we dove in before I could get a photo of the dish in tact. Even though I inhaled the pieces, I did have time to notice that I loved the silky tofu they use for this rather than firmer more crumbly tofu. They do something interesting with the coating though because rather than just being crispy, it’s also has a gelatinous quality about it. This is all that was left when I realized I hadn’t taken a photo. I saved it from the messy dish, so it’s missing the wonderful dashi it usually floats in. 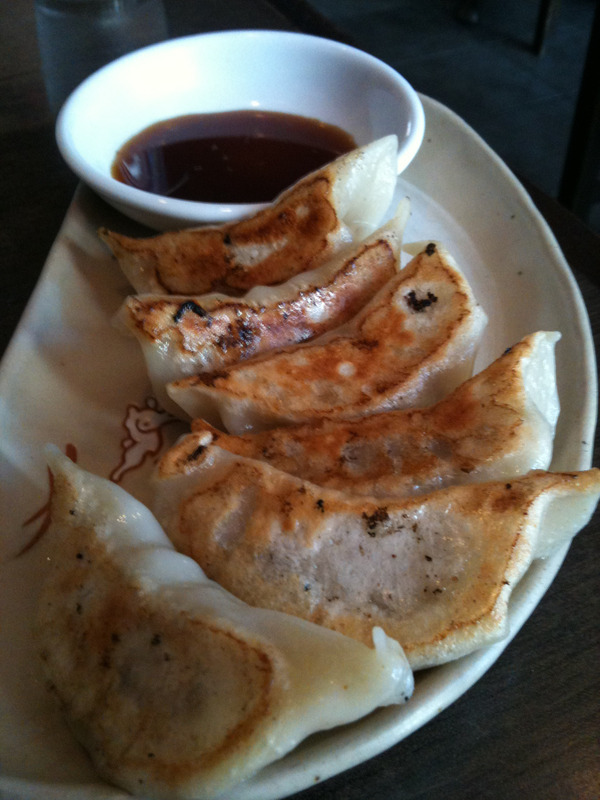 Next came the gyoza, the specialty of the house. We ordered 6 Ebinira, (prawn/pork/vegetable) and 6 Ganso (pork). I have very high standards when it comes to gyoza because I think mom makes the best, but these ones are pretty good. The wrapper isn’t too thick, the fillings are flavourful and they’re pan-fried quite nicely. My only complaint is that sometimes they’re a bit overcooked, which toughens the meat filling. When that’s the case, I usually stab at the wrapper with my chopsticks and then put the holey side down in the sauce so it absorbs into the filling. 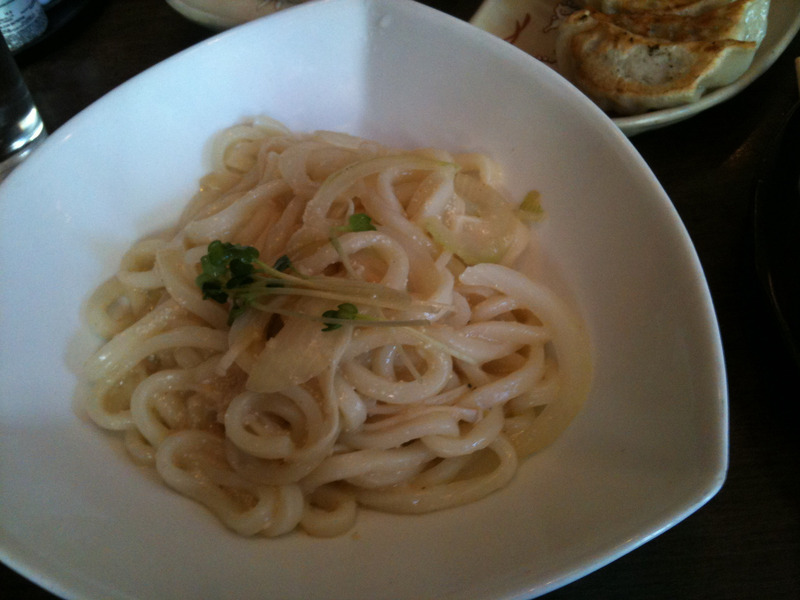 Next came the Mentaiko Udon. Mentaiko is spicy cod roe, and it’s wonderful tossed into spaghetti with oodles of buttery noodles. It’s a simple dish, but one that’s difficult to perfect because it’s easy to over cook the mentaiko. I try making this at home when I get mentaiko from Japan but it never turns out that well. I’m guessing my failure is due to the fact that I’d never dare to use as much butter as was probably used to make this version. Last came more “filler”, the kimchee and barbeque pork cha-han. 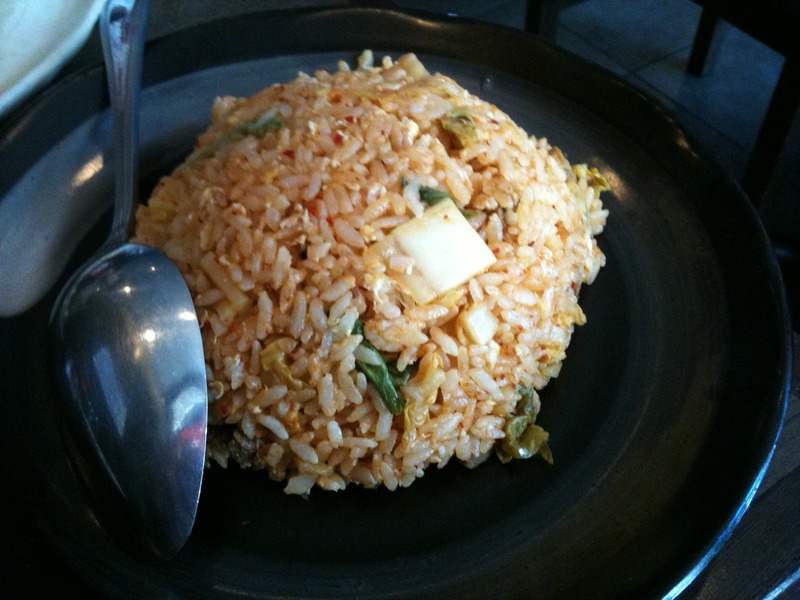 Cha-han is Japanese fried rice, that’s not quite as “fried”. I love it because it was the only way my parent’s could get rice when I was a kid. I notice that due to the number of dishes we ordered, this isn’t exactly a “Quick Bite”. I’m going to have to try harder to schedule these lunch dates more often because I really miss eating yummy Asian lunches! Thanks E, I have lots of tips like the “holey” one. And remember, I am almost ESL!